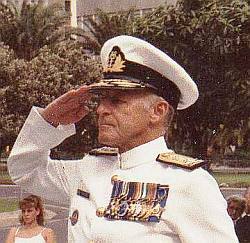 VICE-ADMIRAL Glen Syndercombe, chief of the SA Navy from 1985 to 1989, and prominent in many spheres since his retirement 16 years ago, died in Cape Town this week. He was 73. When the SA Navy’s Strike Craft Flotilla was formed in 1977 in a significant milestone for the navy, Syndercombe became it’s first commanding officer with the rank of captain. The Strike Craft Flotilla was at first based at Salisbury Island, Durban, and at a ceremony attended by the then chief of the navy, Vice Admiral RA Edwards, the base was named SAS Scorpion. Syndercombe commanded the flotilla for three years befpre being appointed director of naval operations. After serving in various capacities on vessels of the South African Navy, he was given his first naval command in 1972, when he was appointed captain of the helicopter-carrying destroyer, SAS Jan van Riebeeck – formerly the Royal Navy destroyer HMS Wessex. Born in Cape Town, Syndercomb attended both the primary and high schools in Sea Point. His noutical career began in January 1948 with a two year cadetship at the SA Nautical College General Botha. This was when the college was still sited at Redhill above Simon’s Town. It later moved to Gordons Bay. His seagoing career began in the British merchant service in 1950 as a cadet, and his first command came 10 years later in South Africa’s Department of Sea Fisheries when he was appointed master of the fisheries survey vessel, Sardinops. 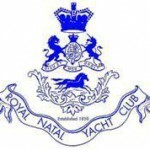 In 1959 he managed to fit in a course of studies at the University of Southampton before transferring from the merchant service to the SA Navy in 1960 as a junior officer. In June 1961 Syndercombe married Carole Langeveldt, also from Cape Town, and they had two sons. Ships in which Syndercombe served in the nave included the hydrographic survey vessel, SAS Natal, while she was on the Pondoland Patrol, the minesweeper Walvisbaai, and the frigates SAS Good Hope and SAS President Steyn. His decorations included the Star of South Africa (Silver Class) and the Southern Cross. Sindercombe was, among other things, president of the Simon’s Town Historical Society, Chairman of the Cape Town Sailor’s Home, vice-chairman of the SATS General Botha Old Boys Association, a trustee and board member of the Simon’s Town Museum, and a member of the Society of Master Mariners of SA. He leaves his wife Carole and their sons Gavin and Brett.